Grace. We talk as though we understand it. The bank gives us a grace period. The seedy politician falls from grace. We describe an actress as gracious, a dancer as graceful. But do we really know what it means? Do we understand God's boundless grace? Grace has a drenching about it. Grace comes after you. It rewires you. From insecure to God secure. From regret riddled to better-because-of-it. Grace can't be contained. Couldn't you use more grace like this? Your church? Your city? Your whole world? This kind of grace changes everything. It's more than we deserve, greater than we imagine. And it's all we need. 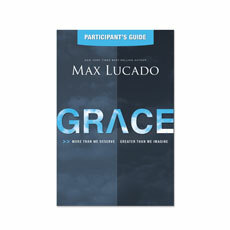 "Max gives us encouragement, hope and a needed reminder that the grace we all possess as followers of Jesus should empower us to move mountains, versus simply settling for pushing wimpy molehills." 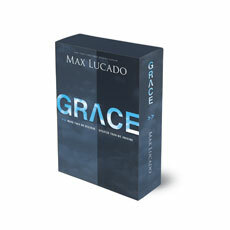 "Few writers are better than Max Lucado, no subject is better than God’s grace"
"If you love the writings of Max Lucado, this will probably become your favorite"
A recent study by the Barna Group found that 53% of people who call themselves "evangelical" believe that salvation is not based on grace alone but require works as well. GRACE, a compelling new seven-week sermon series and small group study, uses Biblical and real life examples to show your church and community not only what grace is but what it does. It helps them understand that God's grace is theirs for the taking and all they need to enter the kingdom of God. Ideal for small group settings this study asks deep questions that lead group members to a truer understanding of God's grace and helps group members experience grace in their own lives. 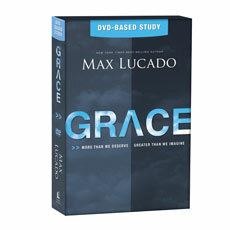 The kit features seven DVD sessions led by Max Lucado, a copy of the GRACE Participants Guide and copy of the GRACE Leader’s Guide to help group participants apply the message to their daily lives. The seven weekly topics include: The God-Shaped Life, Jesus Stooped Low to Take Our Place, You Can Rest Now, Accepting the Gift of Wet Feet, Coming Clean Within Grace that Abounds, Chosen to a Guaranteed Place in the Family, Sustaining and Sufficient Grace. Filled with Scripture study, discussion questions, and practical ideas designed to lead group members to a deeper understanding and application of grace, this guide is an integral part of the Grace small group study. 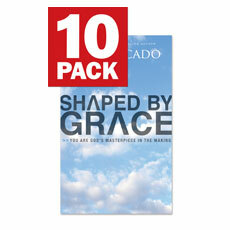 This 64-page booklet is ideal for introducing friends and family to the transforming work of God's grace.